After making a German Rouladen one day hubby asked for a chicken version the next. Always happy to use up left overs in another recipe and I had plenty of bacon leftover from the Rouladen. This recipe didn’t call for bacon, but heck, bacon is always appreciated, eh? So I found a Chicken Cordon Bleu recipe from Taste of Home, and I think the only change that I had to make was, you know, adding in that bacon! 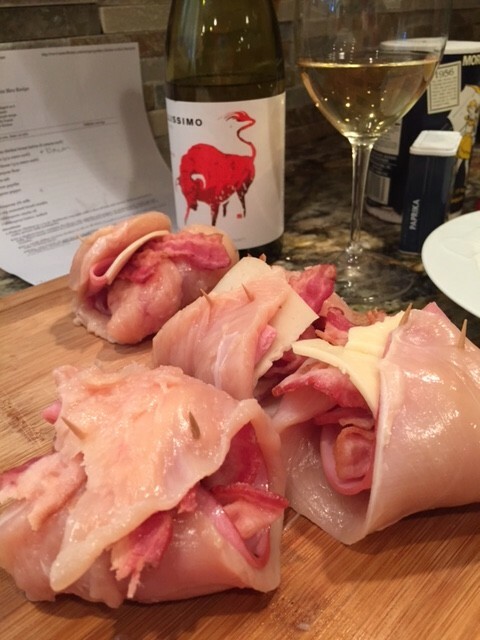 I paired it with a crisp 2013 Bellissimo Cellars Chardonnay during the prep and dinner! 1. Flatten chicken to 1/4-in. thickness; top each with a slice of ham, bacon and cheese. Roll up and tuck in ends; secure with toothpicks. 2. In a shallow bowl, combine the flour, salt, paprika and pepper. In another bowl, whisk egg and milk. Place bread crumbs in a third bowl. Dip chicken in flour mixture, then egg mixture; roll in crumbs. 3. In a small skillet, brown chicken in oil on all sides. Transfer to an 8-in. square baking dish coated with cooking spray. 4. Bake, uncovered, at 350° for 20-25 minutes or until a thermometer reads 170°. Discard toothpicks; drizzle with butter. Yield: 2 servings.